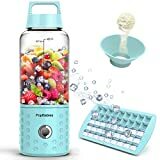 Portable Blender Review - PopBabies - Eat. Move. Hack. Blending has a lot to do with fitness these days. Back in time of Jack Lalanne’s prime it was all about juicing, but now with the many powered health supplements on the market products like the PopBabies Portable Blender take prominence. This is a specialty appliance that has a quirky bit of novelty, but the convenience that it offers users can make it irreplaceable. If you’re devoted to your health and fitness, this is the kind of item you’d never want your gym bag to be without. But whether or not the PopBabies brand has gotten it right remains to be seen. -Unique Detachable Portable Blender: Be safer and prevent finger injury. Handy, Lightweight and Portability. Travel with it all of world No worry plug issues from different countries. - Safer and Versatile Mini Blender: Use only Baby Food Grade Material, BPA Free, FDA, CE & RoHS Approved. Perfect for shake and smoothies, protein shaker, salad dressings etc. - Smoothie Blender no waste and easy to clean: As opposed to a counter board blender: quiet, less mess, fewer dish, less wash, spacing saving, no waste and easier to clean, dishwasher safe. With a portable blender you get to mix your drinks while on the go. Though it may be impractical to tote around all the ingredients for a smoothie, it’s a great idea for those who use products such as protein powders, veggie powders, fiber powders, and, yes, bulletproof coffee. No longer will you face the dilemma of going with a premixed version, mixing it ahead of time and worrying that it will go stale, or simply foregoing your supplement. The promises posed by the very idea of a travel-ready blender are intriguing, but is this the right one for the job? This is quite a unique blender and the bottle is very much responsible for that. You get to blend your smoothie or other mixed treat right in it and then detach it from the base to enjoy. The small-but-shape blades are secured in the bottom of the bottle. It’s a decent sized sports style bottle with its 14 oz. capacity. It’s made of only baby food grade material and it’s BPA-free. It’s also dishwasher safe and therefore easy to clean. The compact size of this bottle makes it easy to carry and easy to store. It can fit well in any car or backpack cup holder. The stylish base is where all the magic happens. When you’re ready to make your blended creation, simply set the bottle into the base, add the ingredients, and blend away. The outside of the base is texturized to help users get a solid grip. There’s one large round metallic button that you use to turn the machine on and there’s a port for charging the blender via USB. The total weight of this portable blender is just 1.3 pounds, factoring in the battery and lightweight motor. One remarkable thing about this portable blender is how it manages power. It is designed so that users do not have to be near an outlet in order to use it, which is far different with a traditional blender. The lithium battery stores up power during each charge, allowing you to blend your drinks without regard to an energy source. When the battery does need to be recharged, this can be done via USB, giving you the freedom to charge it on your laptop or similar device. The USB charging can really come in handy when you’re on the go. Although this device is near-ideal for those who want to make their protein powder ready on a moment’s notice throughout the day, this blender is made to handle whipping up smoothies. It’s excellent for parents who want to make their own baby food even while traveling. Dieters will find that it’s an effective solution for making small batches of bulletproof coffee while out and about. This portable blender can also be used to make soups and salad dressings for those who are concerned about health and taste. In fact, this small blender has enough power to blend ice, turn seeds to paste, and transform frozen veggies and fruits into smoothies. This has to be the most convenient blender on the market. It does the same job a countertop blender can do, just at a smaller size. It’s great for whipping up treats and healthy drinks while on the go. Users are impressed with its power, especially considering its small size. But its size is a key advantage because fitting it into a large purse or gym bag is no problem. Some people keep it at their desk while at the office so they can use it on their lunch break or throughout the day. Others keep it in the car so that they’re always ready to blend up creations while on the go. One charge via USB cable can last for many days. The biggest downside to the PopBabies portable blender is its small size. It simply can’t hold much fruit or much of any other ingredient. Many simply find its 14 oz. capacity to be not enough. And though the included mini ice tray is supposed to be an advantage, a lot of users find it just plain weird. Some prefer that this blender just run on batteries instead of having to be charged via USB. Also, a few people have experienced hardware failures such as the bottle leaking or the motor burning out. They find that it works great when they first get it but quickly loses performance power after a few weeks or months of use. This blender comes with a lot of benefits and few cons. It offers users a convenience that they simply might not have otherwise. You don’t always have to be away from home to put this novel blender to good use. The one and only serious drawback is its small size. It is an advantage when it comes to storing or packing up this blender but a disadvantage if the personal serving you’re making was meant to be more than 14 ounces. The fact that it can hold a charge long is quite impressive. The added convenience of charging it through USB makes it even more perfect for travel. It’s an item a lot of people still don’t even know exists and it can make sticking to the nutrition side of your fitness plan a simpler matter. Busy moms will appreciate this addition to their diaper bags, as it allows them to make homemade baby food while on the go. In short, the PopBabies Portable Blender is the essential item you didn’t know you needed – even though it might not have such a long lifespan.